Cloverfield Clues: USGX8810B467233PX Now Open! The usgx8810b467233px website has been cracked open! Although password was not found, eloOMGmoto found another way in. (I still give someone a prize for finding the correct password, although I actually don't think there is one!) The content of the page is simple, just three links to the MISSING files!!! The pictures show the discovery of the Cloverfield monster (and parasites) by Tagruato subs, deep on the ocean floor, near Tagruato's Chuai Oil Drilling Station (based on the coordinates). It looks like the sub may have disturbed the monser and awaken the beast, causing the Chuai station attack . There is also a transcript between someone named Atsumi, who was on the rig at the time, and Sub #4767. You can see the Monster in the first image, and the parasites in the second image. The depth meter on the second image is interesting, it shows 10,027.5 M(eters? ), which would be over six miles below the surface. 4767: What about the VIP (unknown) to evacuate? ATSUMI: The eco-terrorists had some (unknown) ware in the (unknown) containment rooms. It's been lost. They're all dead. 4767: (unknown) We'll notify the publicity administrator. ATSUMI: It went after them. Another find for GuesstimateJones - a Tagruato logo on one of the Chuai station's support tower! This is good work, but I really think the Parent Directory will be important as well. Need that username/password. "The eco-terrorists had wars in the containment cells. It's been lost. There all dead"
Poor teddy...what exactly went down? Whats the next sentence from 4767? The pieces? Not sure. I guess we can base this data taking place after the night vision military attack photo on 1-18-2008? p.s. I wonder what the "remnants" atsumi refers to in the transcript are. Agreed. Something doesn't make sense. We were told, if the comment was in game, that the missing file would answer Alyse's prayers, meaning she would find out what happened to Teddy. Well, I didn't see anything that explained Teddy's whereabouts to us. Also, is it just me, or is the econd picture UNDERWATER!? This site...could be a Game-Jack, with some photshop editing done to make it realistic. How likely is that? Very low, but the possibility is there. Until we can access it the normal way, and get into that Parent directory, I remain unconvinced. The remnants...could they posibly be the remains of the original monster? I can't remember exactly, but didn't JJ or Reeves say something about Clover being "just a child" at some point? If they did...that means there had to be a parent. And if we bring in the Kinshin comics, then that opens another avenue, where the remains are possibly what the Cult was hoping to get from the kid, or the kid himself, as he seemed to have a power over the creature at the end of the thrid one. All of this is conjecture of course, as I am still not 100% convinced this is the in-game site we are looking for. The sword is a good indicator, but then again, Dennis has the sword on his page, and we know this blog is not in-game. I believe the site is legit. The fact that it was registered before the dvd came out (leading to the sites discovery) is too big a chance for it to be a game jack (who'd of guessed the missing file on the dvd would be 233 before hand). I'm guessing teddy's disappearance is attributed to the 'eco terrorists' ...they're all dead' statement. I'm willing to bet though a much needed clue is mentioned from the parent directory somehow (graphic, explanation, etc. etc. ), perhaps eluding to the origin of this data (did janice get this out herself? is this the whistleblower?). Whatever the case this is obviously the beginning in not only telling us what happened to teddy but the origins of our monster. dude... this site is in game! i believe it... all the pics on 01-18-08.com look fake too, but they're in-game too. her answer was there. teddy is dead. but it gives us some great pics of the parasites and drilling. i'm just disappointed because clover took down the chuai station quickly but in the pic it looks puny next to the rig. It tells us that Teddy is more than likely dead. But from wars in a containment room? And of course the picture is underwater, they both are genius. HAs anyone tried websites for any of the other supplemental files? anyone know good internet hackers that have been caught by the law b4 and are now realeased and are either really interested in cloverfield or is a good friend of urs??? It's not wars, it's ware. Check out the full transscript at unfiction-forums. ATSUMI: The eco-terrorsts had some (unknown) wars in the (unknown) containment rooms. Its been lost. They're all dead. so how did he get in?! cause we need that parent directory do we not? Where's Clover in the first pic? I don't see him. Idk but....do I see a symbol on Clover's cheek? In the first picture there are light up sphere things all the way up the legs of the rig. These from what i can tell do not exist on "real" oil rigs. They appear to be man made. More proof that this rig wasn't built for drilling. So what are they? My guess is that these are the "Containment rooms" spoken of in the transcript. I belive that the transcript is from someone trying to search the containment rooms to recover research. if teaddy was put in a containment room after he was caputred mabye he is still alive. has anyone noticed on the cloverfieldmovie.com site that during the beginning of the trailer it switches to fullscreen and you see the ending where beth screams robs name and then you see the guy? and keep looking for that password! 1. The area of ocean in which the Chuai went down is too deep for any form of oil rig available today and Chuai was never a 'real' oil rig to begin with. From Tagruato.jp: From the Arctic Ocean to the Mid-Atlantic ridge, we go deep. Capable of excavation at distances exceeding 7,000 meters of water and 9,200 meters of seabed, the greatest depths of the oceans have been opened for business. 2. The deepest part of the Pacific - the Mariana Trench (11 km / 6.8 mi) is deeper than Tagruato's sub. I think it is reasonable to think there might be an undiscovered deep spot in an ocean that is 41.1 million square miles in size. Damn, I was so close to getting this. Oh well. Second picture means at least 3 subs (DSV's) are in the area. Maybe 2 are Remotely Operated Vehicles with 1 manned (2nd pic, manned in center, ROV off left with 3 lights). The manned one in the center appears to be made up. Doesn't look like any other DSV, the bubble is too big. The blisters greentorp noticed have the Tag symbol on them, weird it would be on the blisters. If they are containment rooms, how do they deal with the pressure of going that deep? Do subs put stuff in there? Can people even fit in the pipes going to the blisters? Or maybe they are camera pods? Lot of exterior lights for some sort of room, perhaps the projections are camera equipment. Maybe the containment room was something below the surface? The remnants Atsumi is trying to use are probably equipment as he says he cannot get a link trying to use them. Perhaps part of a satcom device? He probably talking to the sub via a ELF system. Well time to work on the login. pwn master paladin - the whole 'child' thing was refering to the state of mind the monster was in - confused in a new place and little knowledge of what to do - like a child. Some cool stuff there. Has anyone gone over the News reports for relations to the images? Parent directory just takes you back the folder on the next level up. great job guys! seriously, this is great stuff! we just now need that username and password. i agree that it SHOULD be something that alyse can figure out, otherwise what's the point of giving her the site? Look at the monsters Head close up I think the real Clover is on its check that its mother, see the light from whatever that thing is far behind(a sub I guess) is shining right on it! Ah, thanks for clearing that up. I love cloverfield, movie and ARG, but I just have to say...DAMMIT!! Every time we think we are getting near a few answers, it turns out to be new questions! "pwn master paladin - the whole 'child' thing was refering to the state of mind the monster was in - confused in a new place and little knowledge of what to do - like a child." We've never been given any indication that the "child" line was a metaphor. Considering how it's referred to throughout the special features on the DVD as a baby, this is very unlikely to be true. Did anyone else notice the word "sword" on the line of text at the bottom? sgtrandolph, i noticed it too but haven't been able to make out what to do with it yet. I think we might have all missed a bigger clue. 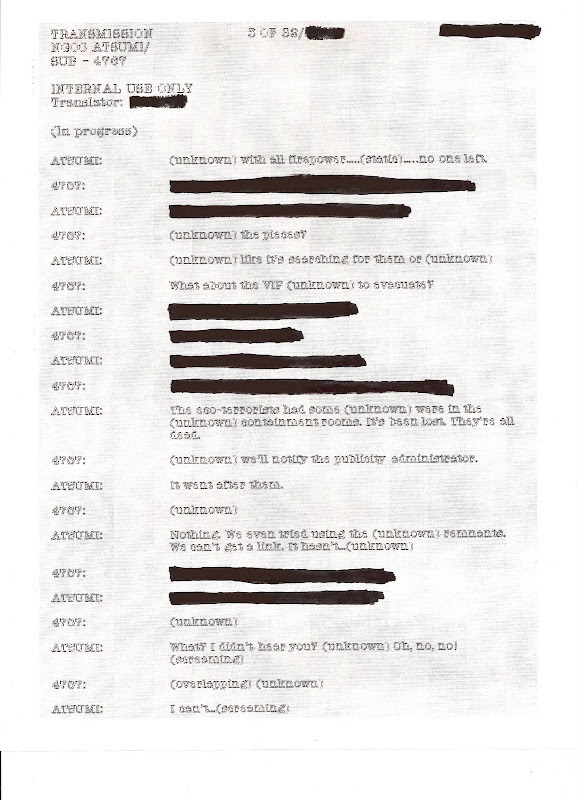 At the very top of the transcript page, it says "5 of" some double digit number. Could there be more pages like this? And what of the blacked out parts? Who changed them? Ganu? Couple of things ... first off, the gov't is bad about censoring official documents when released to the public. Second, I noted the lat/long on the bottom left of the photos ... guess where it points to? if nothing else these photos CONFIRM that the tag folks knew about clovie and it was at least indirectly related to research being conducted there ... or i'm jumping to conclusions again. btw, has anyone else noticed that the symptoms of sea nectar are parallel to that of hgh? The transcript says something about using a remnant and can't get a link. It sounds like to me they were controlling the monster. If you recall from Teddy's recorded message, he says that "they have made something or found something". I submit that Tagruato made Clover with the Seabed's Nectar and that they had some sort of way to control him. In fact, I wouldn't be surprised if the falling satellite had something to do with it. Could that be a reason why they can't get a link? The Thing that the sub is shining light on in the first pic is not a mark or another clover. Its the large air sacs on the side of his head. you can see them reall good at the end of the movie and on the figure as well. thank for adding the translation, dennis. i saw it on the unforum site also and it's much easier on the eyes, lol. Yeah, I think Teddy made it; I find it curious to what the transcript is referring to 'It went after them.' I'm thinking Teddy and maybe some other memebers of his group made it out alive; but if the monster is going after them, why them? What if they took something important to cause the monster to realize it's missing? midgard - I've read countless comments against the 'child' theory and as I live in England, can't get the DVD yet. How often is the word 'baby' used? I think they control Cloverfield to harvest "Sea Nectur" and the technique for doing so went terribly wrong. on the lowest lit up orb on the station support in the 2nd picture, u can see a tagruato logo! clear as day. just thought that was cool. and I agree that there are 2 or 3 subs lookin at it in the image. i think the link refers to the fallen satellite, maybe somehow they used the satellite and some other things to control the monster. or maybe its just a communication link. actually that makes hella more sense. i bet its just a communication link between the station and hq. Does that mean that America knew about the monster before it came to New York and they thought they just killed it. 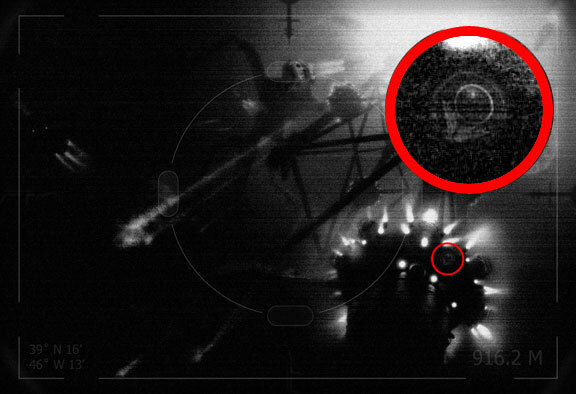 The picture on 1-18-08 shows fighter jets or something bombing the ocean, and it seems that the night vision picture and the missing file pictures are connected, so they are probably bombing the monster, which would mean they knew the monster was out in the Atlantic Ocean. Did TIDO try to sabotage the station and while doing so awoke or released clover? Is that the "firepower" Atsumi is talking about? It couldn't have been the naval engagement, the station was the first encounter. Jasund has an intriguing idea. But if the satellite is relaying control inputs, what remnants are they trying to use to make up for that? Though I still stick with the sat falling knocked out communications so somehow the sub is relaying communications (why else is the sub worried about publicity?). Also how many subs do they have, I guess I was wrong and the first picture shows like 5 (3 on the left, 1 upper right, 1 taking the pic). That many and no tender? Could the blisters be tanks holding seabed nectar? Doesn't that stuff glow bright on the slusho site? Hence thats the lights and not camera equptment? I also think Teddy is dead now, Alyse had a dream about it. What movie is she referring to when she says "You know that last scene in that movie where the mute woman is hanging dead in the water" in the same post? bobby - not America, but Tagruato. If u ask me, the clovie that we see here looks like a baby, because the clovie in the movie is a big as skyscrapers so do u think the sea nectar made him much larger????? Jus a thought. The special feature on the Dvd called "I saw it! It's Alive! It's HUGE!" Shows both Matt Reeves and Neville Page admitting that Clover is a child. While I agree that it is Clover in the picture, I dont think he(she?) is big enough to take out the Chuai Rig on it's own. My theory is that the mother and Clover were together when the mother went after the rig, and during the attack the two were seperated, and in the confusion Clover followed the next biggest thing it could find, the oil tanker, which lead it to New York. Btw has anyone watched the Chuai destruction video in slow motion? If you watch a few large, white, square pieces fall off the rig, get about half way down, then suddenly shoot away as if they went to lightspeed or something. Any ideas? My personal guess is that this is the end of the ARG, except maybe a post from Teddy's sister reacting to the death of her brother (anyone email the link to her). The reason this link between Tag and the monster came out now is because they couldn't show us pictures of the monsters before the movie came out. I count at least two a-10's (from the missle plumes), a couple of f14's, two cruisers, a destroyer and i'm not sure about the smaller one. old info i'm sure. that and the fact that there is information blacked out of the hud image of whatever it was that took the photo. Most importantly the date/time stamp, so you can't be sure if this was a before or after. But think about it, a big monster is headed for a major american city ... you're the president ... whadoyado? more important question is, if all these pics refer to a in game site, which ones did we miss? well i appreciate the extra credit but ive gotta say i really dont think its a sub. those things look attached to the structure. maybe there just a lighting source or something idk but i really dont think they're subs. theres def 4 subs in the background tho, 2 looking at clover. i'm almost willing to go with ben that clovie was a result of the research at chuai, whether incidental or intentional. biggest problem i have with seeing clovie as a creature chilling on the bottom of the ocean for a few millenia is how the heck it suddenly develops the ability to breathe air and survive on the surface ... these are just simply traits i wouldn't expect a deep-sea organism to have any need for. guesstimate jones said... those things look attached to the structure. maybe there just a lighting source or something idk but i really dont think they're subs. Yeah, I think you are right. The forced perspective makes it looks huge, but I think that is just one of the legs of the station. Anyone else notice that it appears as though the supporting structure on the front left side is missing towards the bottom of the picture? I have been looking very closely at the picture, and it looks like the supporting structure on that side has been destroyed or is at least gone, presumably knocked away. Also, it's definitely not a sub the symbol is on. You can see the pod shaped features emitting light all the way to the surface. My suspicion is that they are storage devices for seabed's nectar. As one person noted, the nectar shines, presumably very brightly. Otherwise, what would be the purpose of having that many lights? Besides, the power needed to generate that bright of a light at that many junctures would hardly be economical. 3 things about the picture of the parasites. The shadows are wrong. If you look at the two brightest lit parasites, they should have two shadows pointing in opposite directions as they are being lit by two very bright lights from two different sides. As is, each has only one distinct shadow. Aside from that, doesn't it look like the object lighting the parasites is dead in the water? It appears to me as though what ever it is (sub or maybe part of the rigging?) has sunk and is merely resting on the sea floor. Finally, if you look directly below the second brightest parasite, there is a very bright spot visible on the sea floor? Could that be some seabed's nectar? In the news clips on the DVD you see a man in the helicopter as they look down at the station. He is holding a briefcase that is handcuffed to him. Seems VIPish to me. Less important, you can see the monster swimming NE on the screen of the French version a short while after it collapses. Another thought on the parasite picture. Given the large number of parasites in such a small area, could that be Clover's resting place? Perhaps that's where they found him (or her:))? In the first picture, is the rigging falling down? I had initially thought we were looking up the rigging at an odd angle towards the surface of the ocean. What if we are seeing the rigging collapse and the bright light at the top is the main station exploding? That might explain the bright streaks shooting to bottom of picture on the left. I really think that Anonymous who is providing Alyse with these top-secret files is actually John Garrettie. I think he fell for a girl and decided to help her. He sure did have access to such documents and he just wanted to help her so that CIA wouldn't find out that it was him not to put his career at risk. This may be known already, but in the German broadcast at the Chuai station at about 1:35 it looks like the person in all black is point a gun at the camera, it looks like it has a red dot sight on it. It might be a camera, but it looks like a gun. i don't think whales would even last long outside of water, even though they breathe air ... and going with the whale theory, they are deep sea organisms, but they eventually come up for air. clovie apparently never did. i could be way off track, but the presence of "unnatural" characteristics tends to make me think of clovie as an unnatural creature. it does look like a part of the support structure is missing. i am also intrigued by the mention of "containment" rooms. what was being "contained?" sbn would be stored, not contained. and aparently, whatever was being contained, there was more than one. Update: the transscript says 'were' and not 'ware'. I'd guess that was Clover's nest there. Hey...what are those dots over there in the left side of the picture? What if bellow the station was infact the containment area. What if the had the monster locked up there. bellow the surface of the water and on this day he broke free. That Tido wave came there witht he intents to stop them from doing more drilling and what they found was a creature being held against its will. Then they do what they think is the right thing and let it go. Then of course being one pissed off thing from being tortured and cept for so long it destroyed the station. The photos are survalince photos of what was going on. What is the thing shining the light? How do we know Clover never came up for air? We don't have 24/7 surveillance on the entire Atlantic. It's been stated that one of the inspirations behind Clover was the "Bloop" incident. A noise that the U.S. National Oceanic ans Atmospheric Administration recorded multiple times, the frequency of which meant it was louder than sounds produced by most whales. if you look directly to the right of clovie's head, it seems to be something there that looks sort of like a rectangular with something coming out the back of it. Also similar to the top right corner as well. sgtrandolph, yes I think all versions have what looks like a security guy aiming what I think is some form of the MP5 towards the camera as though he's checking everyone leaving. Perhaps looking for TIDO people. The structure in the first pic appears to be the derrick that is snapped off in the beginning of the video, except it doesn't appear to be any blisters on it. Though it could also be some sort of fixed platform base, Watching the vid in real slow mo the sea lights up in spots around the legs. Another theory, maybe the baby thing is right and they had Clover's mother and they were testing on her, controlling her, or they killed her for the nectar or scientific reasons, Then Clover wakes up, sees that his mother is missing so he attacks the station hoping to find her there and maybe she wasn't and she was in the tanker or her remnants were in the tanker so it went after it because Tagruato wasn't willing to just give up whatever was in that rig. But I always thought that baby thing was more of a metaphor but now I'm definitely beginning to lean more towards it. I think it definitely has somehting to do with it. By George, I think I got it! Something at least. Anyway, I emailed my findings to Dennis and hopefully he'll forward it on to people with the means to piece what I have together. Shadow of a small boats seems could be seen on right hand corner of Pic 1. Is that the boat that showing on the Youtube Video abt Chuai Station collapse (that escaping boat)? I really dont overreact much but...OMFG THIS IS AMAZING! We now know that it was all Tagruato's fault and the reason why the monster has awaken! MOST AMAZING THING IN THE ARG BY FAR!! from what I can tell that is just the basic code for tracking how many people visit your site, and from where etc. a real service provided by google. Have other in game sites been tracking as well, or is this a first? It seemed a little out of place, because I'd be surprised if a real U.S. important website (which this is supposed to mimic) used it. i think that could be the escaping boat, but who knows? by the way, i HIGHLY recommend the RiffTrax for this movie. As much as i love "Cloverfield," the riffs on it are very clever! i hope someone finds out the password/username to the parent directory soon! I'm wondering that in the second picture if that isn't the "ocean floor" but maybe the skin of clovie laying on his side. Also in the first photo, it looks likes missiles are raining down, or maybe debris. It's going awfully fast though. And in the upper right area looks like a shockwave from a major explosive. Nuclear? 2tone ... i'm looking for the logic behind the whole thing. if clovie breathed air then there would be sightings of it prior to this whole mess. yes, there are things that live on the bottom of the floor that we don't know about (giant sea anomones, obviously mispelled, were only recently discovered, for instance), but they evolved living on the bottom of the ocean and don't survive long on the surface. The fact that clovie did survive suggests to me that for some reason it was genetically predisposed to survive on the surface, much the same as godzilla, who in the last movie was actually a big, mutated iguana. just a thought. plus YMR is into genetic research ... can anyone say Jurassic Park? Very awesome. If you look at the very bottom center, of the second picture, I see something that resembles the sword. Just a thought, probably unimportant, but man am I seeing swords all over! Secondly, these photos make awesome desktop backgrounds! What is the first picture of? an someone explain it to me in detail? I can hardly see it, my monitor is to dark. Could the monster be involved ? Maybe someone has to log in to the site... if it was a true CODE then why would it say username and password. I'm asked for a username and password when I leave a comment. Dunno if this proves that there is no username or password or anything but if you do google search the site for all webpages it brings up only 3 html pages. The ones we already know about. About the first picture.... you guys DEFINITELY need to be aware of the fact that the depth in which the picture was taken is about a KILOMETER, which means about two third of a mile, and I know that the ladder-like structure clovie is holding to is not something normaly expected to be under the water. At first glance they're just walking along the ocean floor, where the sub found them. On further examination, the texture of the floor isn't right at all. And now, I ask you, where do the Parasites usually walk? More importantly, on WHAT do they normally walk? That sub could have possibly woken up Clover. Is that a Sword I see? "by the way, i HIGHLY recommend the RiffTrax for this movie. As much as i love "Cloverfield," the riffs on it are very clever!" Tried it. Hated it. The riffs were horrible and unfunny. Sorry. Even though i dont really believe that Tagruato was keeping something "hostage" when its supposed "babies" could take down cities there is some chance that it could be right. Could the deep-sea nectar Slusho's special ingrediant have been from the clover mother (ie. blood) and they didnt suspect or know of another? Also could that of been why the "child" followed the tanker to New York? Because it contained a scent of its mother? I still dont like the idea of it capturing the monster, i like to believe they just woke them up. But it could explain a bit. i watched the movie last night after i mentioned that the parasites didn't appear to be on the ocean floor ... there are a few spots that you get a good look at the texture of clovie's skin. it does kind of look like the "ocean floor" in the parasite pic. plus some of the parasites appear to be "feeding" off the ocean floor, similar to how ticks feed on a dog. as for sea nectar, i've been thinking that it has absolutely nothing to do with clovie directly. i will send dennis an email about it and see if and where he feels it should be posted. zaggs - if NY was attacked in 09 and the Chaui rig was attacked a few months before the film, then the rig went down in 09, not 07 (the OOG time). And I don't think we can say anoything directly on the size of the monster - do we even know how big the bit of rig we see is? And how is the sub 1/3 of Clover's size? We can see it is only just the size of its head. 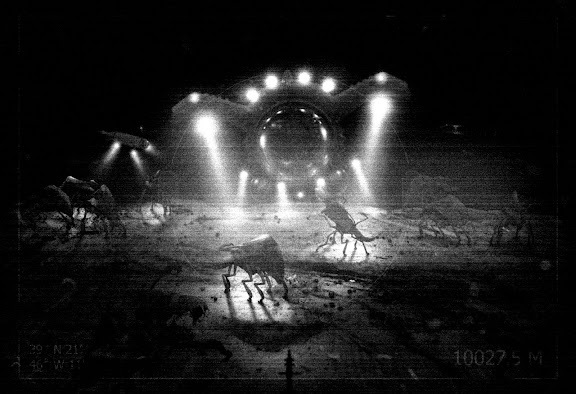 This is somewhat off topic, but over at Movieweb.com, they have an article about how these pictures are part of the Cloverfield 2 viral marketing. This kinda made me mad, because it's obvious they haven't been keeping up with the marketing. Because if they had, they would know this is still part of the first Cloverfield viral marketing. Sgtrandolf, sho says there's never been sightings of clover before? There's reported sea monster sightings all the time, most of them are denied as random babblings or people trying to get famous. BEsides, we have no idea about how Clover's lungs work, but since they're on it's head, it wouldn't need to expose much of itself to get a breath. Not to mention, based on certain shots from the special features, Clover's lungs expand massively, meaning it could probably hold large quantities of air for long periods of time. I'm sorry I just dont agree with this whole "genetic scientific mutation/experimentation" stuff. To me the idea of it bieng a natural creature that was disturbed is somewhat realistic. When it becomes some rediculously farfetched experiment gone awry like Godzilla and every other damned monster, that's when this story loses a lot of potential and orginality. i want to find out this username/password as much as everyone else, but i don't know what else to do. i'm not giving up, by no means, but i've tried so many combos so many times, messed with the url, etc. and nothing. maybe we are missing or overlooking something. we need to get into that parent directory. i do agree with chris about the username probably being "jgarrettie" but i'm still not getting anywhere with that. anyone have any other ideas? anyone who hasnt said anything yet? 2tone ... yeah, i kinda thought of the whole sea monster angle too ... and you're right. things like the giant squid that were reported as years but dismissed as fantasy before they were actually reported. but as much as you are finding the mutation angle difficult, it's hard for me to accept the sea monster angle ... let's just agree to disagree and see where the chips fall. the subs in the clovie pic are actually about a third the size of his head, which is still large compared to the parasite pic. i believe the sub in the parasite pic is either a diff type of sub (which is a horrible cop out) or is farther back that it appears. the ground cuts the bottom of the sub off and it doesnt appear that the sub is stuck in the ground so maybe the sub is farther off from the foreground and the lighting messes with the perspective. thats how im calling it anyway. MASTER, if you watch the Chuai attack video (english version)in slow mo, watch the part where the Tag memo comes up, try to pause it before it fades out. Its written Jan 2nd 2008. It says the station was attacked on either the 26th or 27th of December (more evidence comms were out) which would of course be in 2007. The events of the movie should be in 2009 as Rob says at the end "Saturday May 23rd". May 23rd on a saturday would be in 2009 (not in 07 or 08). Also in the first pic there are 3 subs on the left side of the picture (kinda look like turned on flashlights) at different distances from the camera and most of Clover's body. In that pic he's not as big as when he (or another) attacks new york, theres just no way. He'd be damn near as big as the station at least in height and length. guestimate, if you want an indication of the length of the mini-subs in the first pic (and no, no, no Tag is not building missile destroyers AND nuclear subs before someone tries that reasoning) look left side-mid height. 3 front lights, 2 small lights slightly aft amidships and then a bit further back its wake. That one should be closer to the camera then Clover, but its still big compared to clover. Or look at the top right corner of the framing square is yet another subs but more of a profile view. I still want to know where the tender ship for all these subs are, I cannot believe they'd be hauled out of the water by the station. Perhaps the temporary facility Ganu mentioned in his memo to the company. i was just going to make the observation that if you look at the first picture, there's an object to the right of the monster's head that is spotlighting on it. then if you look at the second picture, there is a sub "spotlighting" on what may be the monster. so maybe we're seeing where the second picture took place in the first picture? I think the containment they were talking about was (and i know this is a stretch) was the controlling of a second Cloverfield (be it a parent or something else). And they were keeping it, alive, and controlling it (probably with the use of the satellite that crashes) to reach the very bottom of the ocean to bring up the Seabed Nectar. And during a routine run for Nectar (since they had already implemented it into drinks, so it was like any other day going for supplies) the satellite crashed into the ocean, therefore "breaking" the hold on the baby. 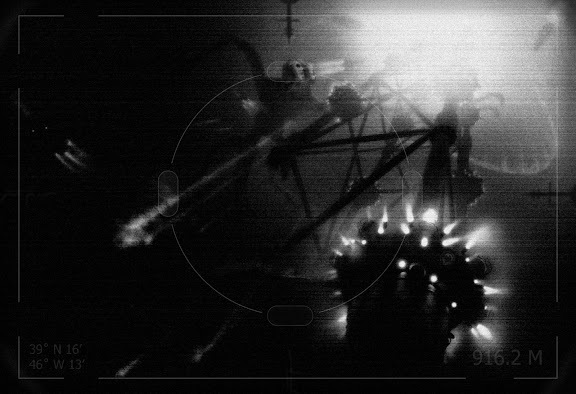 And it woke up the second Cloverfield and THAT was the monster that destroyed the station while it was. And from the picture of fighter planes attacking something in the ocean at night, ended up getting killed. And IMO, and for my idea WE (the United States) were the ones who destroyed it. So that would explain why nobody knew about what was happening in New York seeing as we thought we had killed it (of course I think the government would cover something like that up and brush it under the table not even alerting the public it had destroyed some monster in the ocean). Of course Tagruato would deny all responsibility and say they had no idea what it was. Probably calling (the US government) for the air strike on the monster saying it attacked the station. So the US government, along with Tagruato both thinking it was the end of it went on not giving it a second thought at the possibility of another monster. So weeks/months (i'm not too sure) later Cloverfield (the one who DOES attack New York, and the one that was controlled) makes it's journey to New York until it decides to attack. Pissed off that something killed the other monster. I think the parasites "make" the Nectar and they were what occupied the containment chambers. Going out on a limb and want to say Cloverfield eats the Nectar they make, or the parasites themselves. I want to say them ending up ON Cloverfield is them attacking and biting Cloverfield, kind of like a defense mechanism. I also think when they bite, they inject their prey with a super high dosage of whatever it is that makes the Nectar give strength/mind enhancing effects. On humans, it somehow makes the body explode (Marlena, and the dead soldier they bring in on a stretcher with a hole in his gut). But since Cloverfield has lived off the Nectar or the parasites themselves for a very long time, it built up an immunity so them injecting him with the stuff is only making him stronger or have no effect at all. Would explain how Teddy got a hold of a "pure" sample of the Nectar to send to Jamie. He was a spy of sorts on the station while working for TIDO Wave. Taking samples and getting them off the station somehow. guesstimate jones - remember - the parasites are titch compared to the big monster, so its not unlikely it could be the same sub. zaggs - I've been arguing with many people here that the film is set in 09, so no need to try and prove that to me. But if you go to sites like Tag and TIDO, their dates are also done in late 07/early 08. Now the satelite is said to have fallen a month before the film came out and as we know, happened a month before the main events of the film. This means that all dates that say Jan 08, become May 09 and Dec 07, become April 09. Make sense - those dates were only used pre film to stop people getting confused). webb - The pics were taken at two very differentdepths, so that's very unlikey. samsam - I can't see any of those 'holding' containers in the second pic. It's been rumored that the reason Marlena, and anyone else who's bitten, explodes from bites is because whatever venom the parasites carry, causes people's bodies to start producing massive amounts of gas and liquids, and to not stop. So stomach gas, blood, plasma, bile, all of it, it just keeps producing more and more until you pop, explaining the blood leaking from Marlena's eyes, and why when they start to drag her away you can actually hear her burp. We know the Chuai station was destroyed in '07, and the vids came out in '08, and the movie takes place in '09. Because otherwise the chronology makes no sense. But this theory only works if Cloverfield 2 is a sequel. We have no clue as to what happened in between Kishin, which takes place in an unknown time, The Viral stuff, which takes place in '07/'08, and Cloverfield itself, which is '09. So if Cloverfield 2 takes place in '08, then this all fits together, and there isn't a ridiculously large time gap. For the last time - all the viral dates are in late 08/09. They only say 07/08 on the sites so people wouldn't be confused and put off. from what I can tell that is just the basic code for tracking how many people visit your site, and from where etc. a real service provided by google. Have other in game sites been tracking as well, or is this a first? It seemed a little out of place, because I'd be surprised if a real U.S. important website (which this is supposed to mimic) used it." They Be in our computers tracking our urchins! But seriously, I downloaded the .JS file, apparently there's an error (unestablished variable "Document") line 117, or something. Apparently they can't track our urhcins? Got username and pass, but they lead to the index. Doesn't get any of us any closer, but we don't need to bother with it now. In other words, there is no real parent directory, its just there to make this site looks like you're browsing the contents of a directory. We're going to have to look elsewhere for more clues, because we've found everything this site has to offer. Yeah haha I'm pretty sure we noticed the monster. And I was thinking that the "unauthorized.htm" is static, but I don't know much about web design. But then again, that's the address the link takes you to, and I don't think that address would change based on what password you entered. For that to happen, the "/access.htm" part of the directory would have to change, right? Guys. I believe Teddy is alive. And I got proof. Watch this video. Notice how long it focuses on the man directly in the center. Before you say Teddy doesn't have a beard, remember that he wa a prisoner possibly. The coordinates are in DMS on the photo, so all you have to do is convert them into degrees with decimal. Which is in the North Atlantic, around 2000 miles due east of Manhattan. I'm not sure what kind of underwater geography is in that spot, but I think the number at the bottom right of the frame of the photos is the depth of the camera. The one is 10027.5 meters (? ), which would mean it's in a trench, but trenches of the 10,000m depths don't exist in the Atlantic. There's a little blur in the image before the five, which I assume conceals the decimal point, since a depth of 100275m is unheard of. Unless of course this trench is undiscovered. Searching "39.2667N, 46.2167W" on google earth or maps or whatever should get you to it. Clovers were once known for growing on old war grounds after being bombed. The reason i say that is because maybe the creature its self was just a somewhat small, young and undiscovered sea creature before there was any drilling, and after the drilling it consumed some of the stuff from the sea bed while drilling occurred, givning it the compaison to how clovers are grown (the sea creature being turned into a monster as a result of heavy drilling in the deepest part of the sea.) or maybe it is also possible they used experiments on the small creature in the containment rooms, lemme know what you think.. it maybe be a far fetched thing, but who knows. It's a good theory, RichieB. I've been wondering why it's been called Cloverfield. closly and you should see little something something in the water if you know what i mean and when it shows inside of the rig while people are runing for their lives one man trips and looks up in horror like there was a monster or something(laughs)and when the people get up stairs they show a guy looking like his being strangled and when the camera man turns it shows a man with a mask on with a gun yelling something and it shows you the other stuff. Oh sorry I thought I actauly got cool stuff to talk about-but I don't till I found out those vids were on Dennis' youtube channel! PLZ don't laugh at me I'm only ten years old ok give me a break! But there is a funny vid that i found ONCE on this site I know its all over youtube its called spore creature creator clover its very amusing! P.S. Dennis,I'm sorry i screwed up ok! P.S.S.WOW! I can't believe you(Dennis) actauly respoded to my very first post-I think. trailers!Dennis you should post some of them cause some of them actauly made me think it was for real intill I read the dicription.